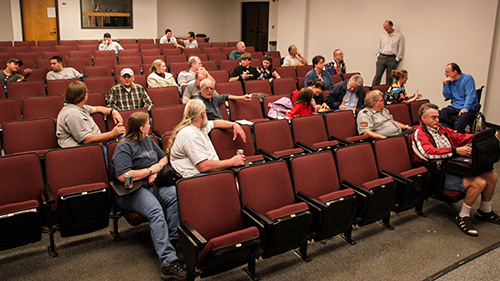 Our monthly club meetings are a great way to meet members, socialize, and learn something new about astronomy. Meetings are scheduled one Saturday every month except for July and August (to accommodate family vacations). All meetings are held in Engineering East, Room EE-191, at CSU Fresno. Meetings begin at 7:00pm and typically end between 8:30pm and 9:00pm. Meetings typically begin with club business, such as coming events and club issues. Every meeting includes some form of presentation by a member - this may be a quiz game, educational presentation, photographical slide show, or something else entirely, but it is always a chance to learn something new. Club meetings serve another purpose as well - allowing members to meet each other in the light! Quite often, we meet new people in the dark at a star party, only seeing a voice, not a face. It is not unusual to hear "I don't recognize you, but you sure sound familiar" at a meeting! Like almost all of our events, meetings are open to members and public alike. We invite you to join us!